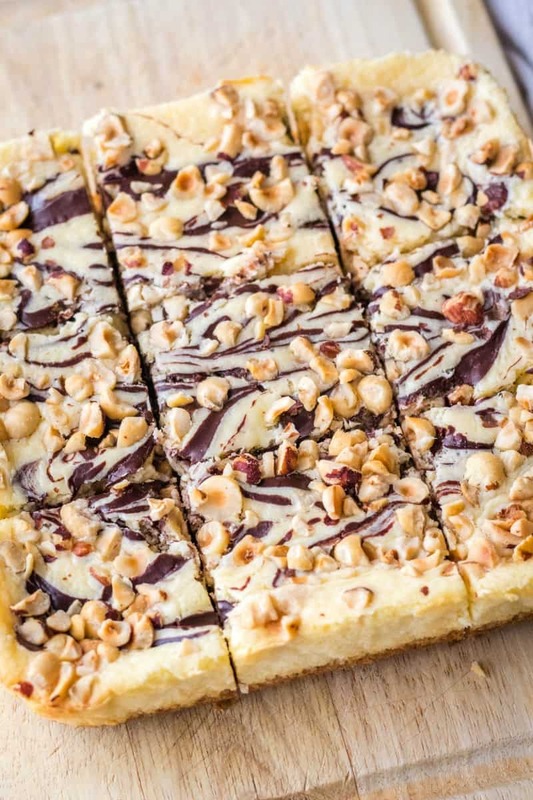 When it comes to indulgence, nothing beats these Hazelnut & Dark Chocolate Cheesecake Bars! 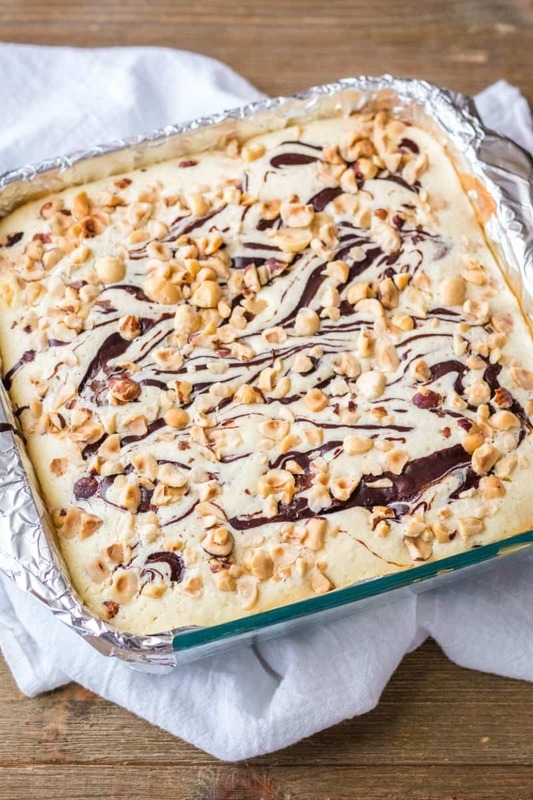 Swirled with dark chocolate and topped with hazelnuts they’re pure dessert bliss! I’m a cheesecake connoisseur. It’s my favorite dessert of all time. Seriously. Growing up whenever my mom asked what kind of birthday cake I wanted the answer was cheesecake. 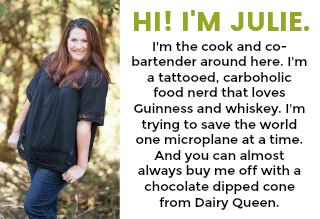 These days I still LOVE cheesecake, but now I make it in a baking dish and cut it into cheesecake bars or bite-sized squares. A little easier than the springform pan and water bath. These Hazelnut & Dark Chocolate Cheesecake bars are the epitome of my cheesecake cravings! 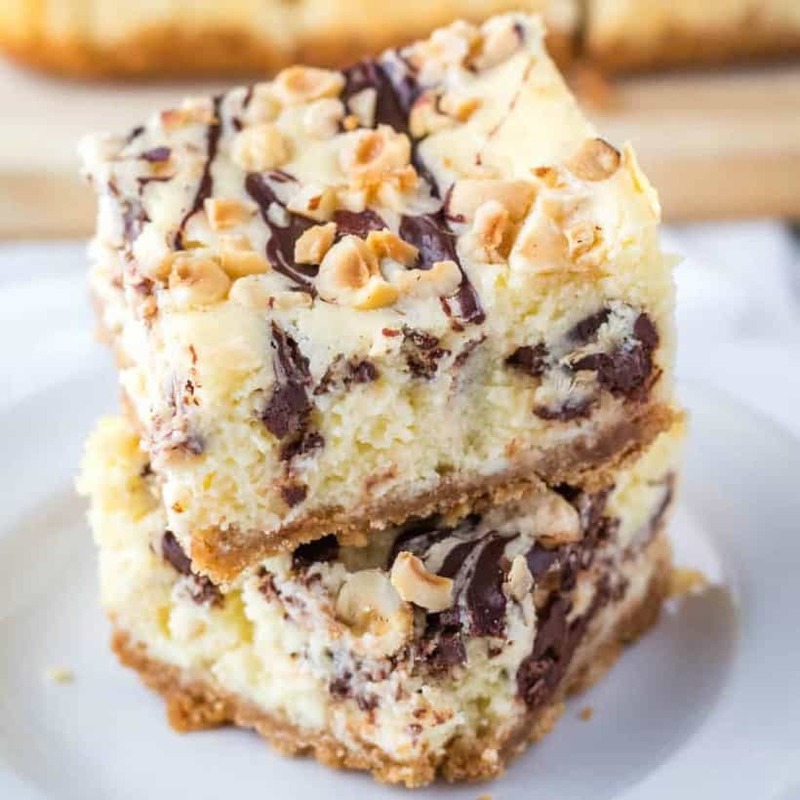 If you’ve never made a cheesecake bars recipe I highly recommend it. The only thing easier is a no-bake cheesecake, and let’s face it…they’re just not quite the same. Make the crust, bake. Make the filling, bake. Let cool. Boom! The hardest part of this recipe is waiting for the cheesecake to chill out in the refrigerator. Crush graham crackers. 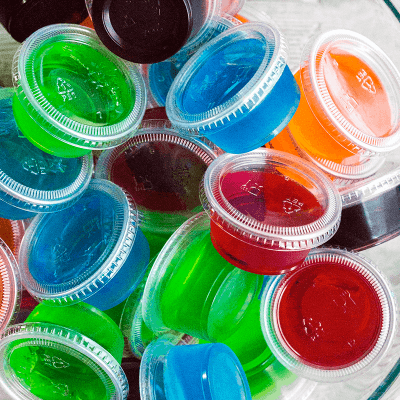 Mix together with salt and sugar. Stir in melted butter and then press into the bottom of a foil-lined square baking dish. Bake for 10 minutes at 350 degrees F.
Beat together cream cheese and sugar ’til smooth. Add eggs, sour cream, and vanilla. Mix again. Pour over cooled crust. Melt chocolate and milk together. Drizzle chocolate over cheesecake filling and then use a knife to cut it into the cheesecake. Sprinkle the top with chopped hazelnuts. Bake for 40 minutes at 325 degrees F. Remove from oven and let sit at room temp for 1 hour. Transfer to fridge for at least 6 hours to chill. I had foil on hand, so that’s what I used to line my baking dish. Don’t try to pry it off the cheesecake until is everything is 100% cold. Gently nudge it away from the cheesecake after taking the whole thing out of the pan. Parchment paper is recommended for this recipe, but it’s not the end of the world if you don’t have any. A note about the nuts. Hazelnuts can be a little pricy. I like to get them when they’re on sale and freeze until I need them. If you want to keep this recipe a little more frugal, chopped almonds would pair beautifully with the dark chocolate and cheesecake. 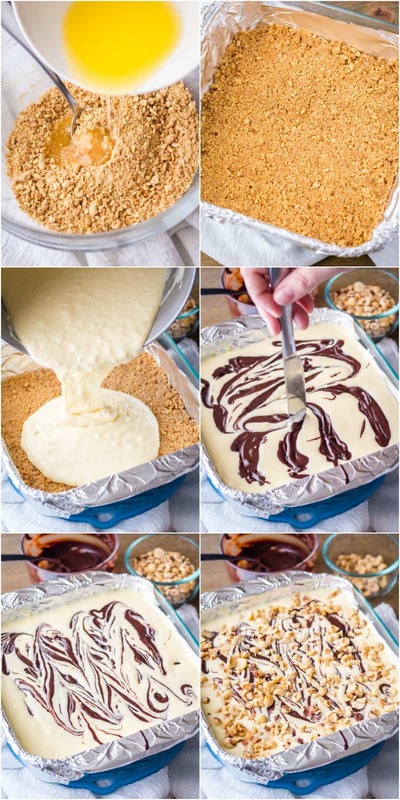 You could even add 1/4 teaspoon almond extract to the cheesecake filling if you like. I’m all about options! 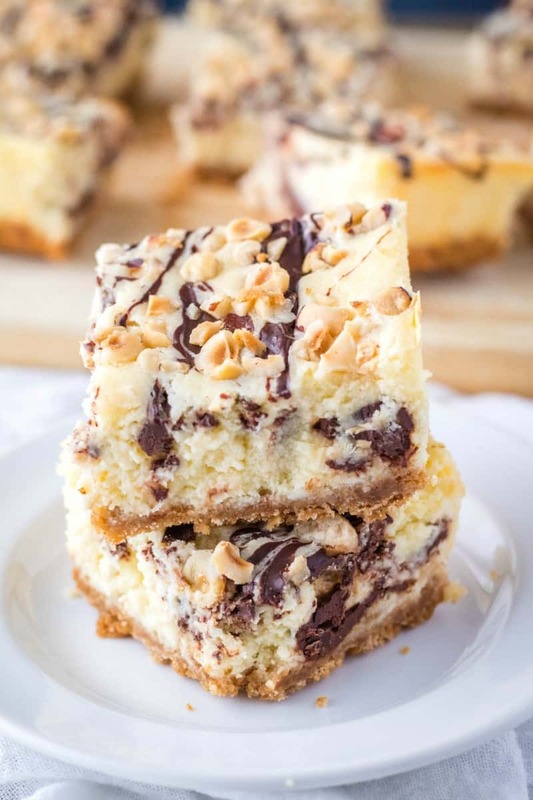 When it comes to indulgence, nothing beats these Hazelnut & Dark Chocolate Cheesecake Bars! 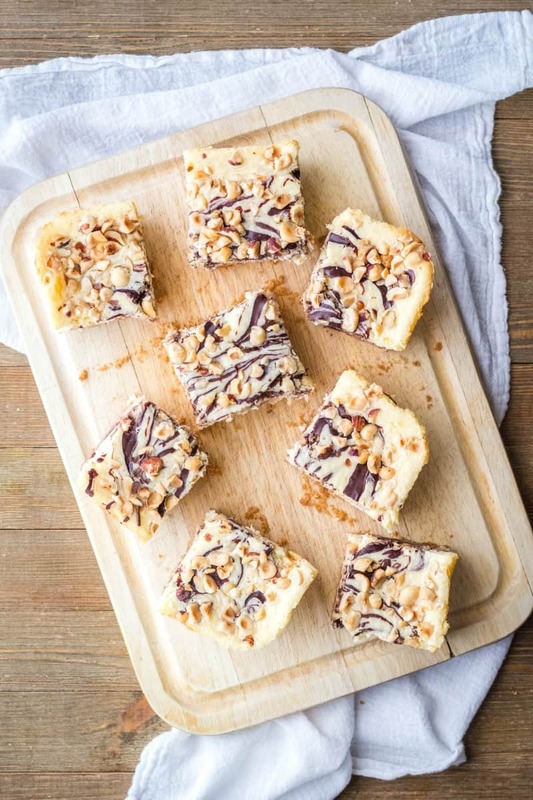 Swirled with dark chocolate and topped with hazelnuts they're pure dessert bliss! Place graham crackers in a large ziploc bag, close the bag and crush graham crackers into crumbs with a rolling pin. (You can do this in your food processor if you prefer.) Transfer to a bowl and stir in the sugar and salt until combined. Pour in melted butter and stir until crumbs are moist. Pour the crumbs into your prepared baking dish. use your hands to press into an even layer in the bottom of the dish. Bake for 10 minutes. Remove dish from oven and reduce heat to 325 degrees F. Allow crust to cool while you prepare the filling. In a large mixing bowl, beat together cream cheese and sugar until smooth. Add sour cream, vanilla, and eggs and mix until combined. Add salt and flour; mix until smooth. Pour cheesecake filling on top of the crust. Use a spoon to spread the chocolate over the cheesecake filling in 4 lines until all the chocolate is used up. Take a knife and cut through the chocolate lines to swirl the chocolate into the cheesecake. Do NOT stir it all together, just swirl a bit. Sprinkle hazelnuts all over the top. Bake for 40 to 45 minutes. The center of the cheesecake will still be soft. Set out at room temperature for 1 hour on a wire rack before transferring to the fridge to cool for at least 6 hours (or overnight). Cut into 9 squares. Serve immediately or cover and refrigerate until ready to serve. You can use foil in place of the parchment paper to line the baking dish. These look like heaven. I love hazelnuts and chocolate. Yummy! !